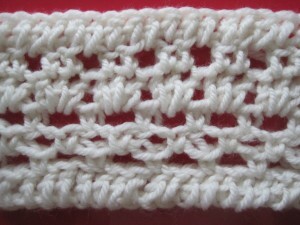 A great way to add to your crocheting arsenal is to learn and implement special stitches. With special stitches you can make a plain scarf, blanket or washcloth more interesting and special. It’s easy to apply the instructions for a special stitch into your upcoming project. Below are instructions for a few special stitches, some photos of the stitches and tips on using them in your project. Check out the crochet abbreviation chart for help with abbreviations and symbols. The Moss Stitch is the special stitch I use the most and the easiest of the three in this post. It’s perfect for making baby blankets and is an excellent surface for adding appliques. Start by chaining an even number of stitches. Row 1: sc in 2nd ch from hook. * ch 1, skip next ch, sc in next ch, repeat from * across. Row 2: ch 1, turn, skip first sc, * sc in next ch-1 space, ch 1, skip next sc, repeat from * across. Repeat Row 2 until appropriate length is reached. A retro way of adding interest to a scarf is by using the chevron stitch. This chevron is also perfect for stripes which really pop out when using this stitch. See Changing Colors in Crochet for info on making great stripes. Row 1: dc in 4th ch from hook, 1 dc in next 3 ch, (dc2tog over next 2 ch) two times, 1 dc in next 3 ch, 2 dc in next ch, *2 dc in next ch, 1 dc in next 3 ch, (dc2tog over next 2 ch) two times, 1 dc in next 3 ch, 2 dc in next ch, repeat from * across. Row 2: ch 1, turn, 2 sc in first dc, 1 sc in next 3 dc, sc2tog two times, 1 sc in next 3 dc, 2 sc in next dc, *2 sc in next dc, 1 sc in next 3 dc, sc2tog two times, 1 sc in next 3 dc, 2 sc in next dc, repeat from * across. Row 3: ch 3, turn, dc in first sc, 1 dc in next 3 sc, dc2tog two times, 1 dc in next 3 sc, 2 dc in next sc, *2 dc in next sc, 1 dc in next 3 sc, dc2tog two times, 1 dc in next 3 sc, 2 dc in next sc, repeat from * across. Repeat Rows 2 and 3 until appropriate length is reached. The smocking stitch is a very vintage open work stitch that was used for…you guessed it…smocking garments! 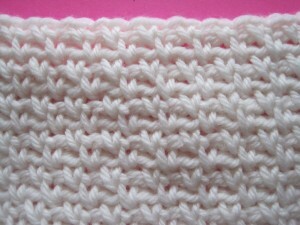 A great application for the smocking stitch today is for washcloths/dishcloths and for lightweight scarfs. Start by chaining a multiple of 3 plus 3. Row 1: dc in 4th ch from hook and in each ch across. Row 2: ch 1, turn, sc in first dc, (ch 3, skip next 2 dc, sc in next dc) across to last 3sts, ch 3, skip next 2 dc, dc in 3rd ch of ch-3. Row 3: ch 5, turn, sc in 2nd ch of ch-3, (ch 3, sc in 2nd ch of ch-3) across, ch 2, dc in last sc. Row 4: ch 1, turn, sc in first dc, ch 3, (sc in 2nd ch of ch-3, ch 3) across, sc in 3rd ch of ch-5. Row 5: ch 3, turn, (3 dc in 2nd ch of ch-3) across, dc in last sc. Row 6: ch 3, turn, dc in 2nd dc, (ch 1, dc in first and second dc of group) across, ch 1, dc in 3rd ch of ch-3. Row 7: ch 3, turn, dc in ch-1 sp, (dc in each next 2 dc, dc in ch-1 sp) across, dc in last dc, dc in 3rd ch of ch-3. Repeat Rows 2-7 until appropriate length is reached. If you have any questions or have any suggestions for other uses of the stitches, please don’t hesitate to comment! This entry was posted on Sunday, July 25th, 2010 at 3:00 AM by Erin Burger	and is filed under Free Crochet Patterns, Tutorials and Help. You can follow any responses to this entry through the RSS 2.0 feed. You can leave a response, or trackback from your own site. Erin- great post- I will definitely be trying that moss stitch—and probably the others too!!! I love the moss stitch…so pretty! Thanks for sharing these patterns. I love the Moss Stitch too! I am new to crochet. Have only been doing the basics, but I do like to experiment and try new stitches, so these will come in handy. I know the Moss Stitch by a different name – Seed Stitch, but it is a great, very versatile stitch that can be used for many different projects and gives a pretty, very warm finished item. A couple suggestions – if you are making a scrap project with this stitch and using different yarns, it works best if you use the same weight or thickness of yarn as if you do not it will show in your finished work, being wider or less wide at sections. (Yes, the voice of experience!) Also, use a hook that will give your stitch some pliability. Since this is a close worked stitch it might feel stiff if your hook is too small for your yarns. I’ve not tried that smocking stitch. Will have to give that a second look. Thanks, Rachel. You always have some interesting here. These look amazing… can’t wait to try them out! Re error in smocking stitch pattern – did you realize that in row 4 you refer to working in 2nd chain stitch of row 3 and row 3 does not have a 3 chain, but only a chain 2? Good Eye! Thanks for the heads up. I have a question about the chevron stitch. Did I read correctly that you alternate rows of single crochet and double crochet once the pattern has been set up? 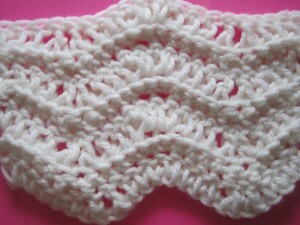 I know the standard ripple pattern is just one kind of stitch, usually double crochet in my experience. I am working on a blanket using the Moss Stitch, I really like the look of my work. I think this is going to be one of my best blankets yet. I have always used the granny square or just the double crochet stitch to make blankets. Thanks Erin for displaying the different stitches. I will be trying some of the others at a later date. Erin~ I’d like to try the moss stitch for a washcloth first. If I’m using worsted weight cotton, can you recommend a hook size that will give the stitch a little sturdiness but not be too rigid? I would use an H hook in that case, and I hook might give you a little bit more of a give though. I would start with the H and change over to the I if it’s too rigid. The H and the I are the two sizes I use most. Row 1: dc in 4th ch from hook, 1 dc in next 3 ch, (dc2tog over next 2 ch) does the dc2tog mean double crochet 2 stitches in the same chain? Hello! Looks like it is updated. If you need more help with it, let me know.